There were so many varieties to sample too. Kali Mirch wali Mathri, Ajwain ki Mathri, Methi Mathri, Zeera Mathri, Plain Salty Mathri. Mouthwatering treats made yet more delectable in the cold cold winters when eaten with home made, sun ripened Lime or Mango Pickles. Somehow I have never been able to coordinate the tradition of making pickles with Mathri in the winters. At times its been the lack of correct seasonal ingredients, at others that of time itself. But come October, I begin craving this wonderful treat. To satisfy the craving I try to make Mathris every Diwali. This year I actually made 2 batches of the plain salty variety and am sharing the recipe with you. Sift the flour, semolina, and salt into a mixing bowl. Add the ghee, and rub it into the flour. Pour in the warm water and prepare a dough. Cover with cling film and allow to rest at least half an hour. Heat the oil to smoking point then reduce the heat to medium low. Roll each in to a ball, then one by one into a disc about 1/6 of an inch thick. Poke each disc with the sharp end if the knife 7-8 times. Add 2 mathris at time in the oil. Fry until golden brown and crispy on both sides. Remove on a kitchen towel and allow the oil to drain. Cool completely and store in an air tight box for up to a month. Patience is the key to making Mathris. Always make sure you have plenty of time when attempting this recipe. The dough once made must rest for at least 30 minutes. Longer is good, and it can even be refrigerated. 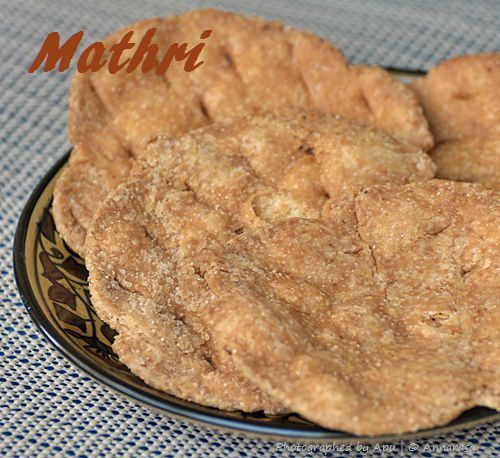 Remove from refrigerator about an hour before you plan to fry Mathris. If using a gas burner, the fry Mathris on a low flame. If electric burner, medium low is required.